Škoda Kodiaq is a car characterized by an ideal interaction of refined lines, dynamic curves, and a sturdy look. 7 seats and the largest trunk in its class: 2065 liters with folded seats in the second row. Škoda Kodiaq presents not only outstanding comfort in the cabin, which is guaranteed to every passenger but also a large number of electronic assistants that will help make your trip better! This car will not leave you indifferent! Rent Škoda Kodiaq in Prague for travel around the Czech Republic and Europe. 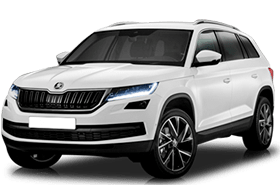 Book Škoda Kodiaq in one click! or fill out the booking form completely!